The Library has historically been the hub of City and Country. It provides a physical space for all kinds of activities–from research to reading for pleasure to faculty meetings–while the program itself is an integral piece of the curriculum at all ages. Children begin their literary journey as young as the IIs, with visits to meet the Librarians, hear stories, and discover part of the larger world through the Library’s connection with the school. 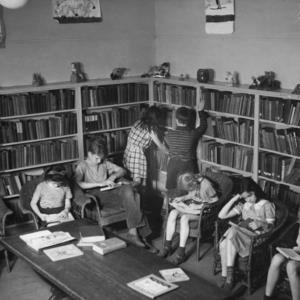 In the IVs, children begin to come to the Library independently to research block constructions or other classroom-related or personal investigations, or to browse for a storybook. Beginning in the VIIs and continuing until graduation, all children come to Library daily to read independently. They are taught to choose appropriate, interesting books, and are supported in their reading through regular conferences with teachers. As comprehension is monitored and reading skills are developed, students are encouraged to explore books more deeply and to read more broadly. The daily reading program is primarily concerned with the children's attitude towards reading and toward themselves as readers; skills development is addressed with this primary focus in mind. In addition to work among students and teachers, the environment itself—comfortable chairs, children’s artwork on the walls, and book displays showing new or reviewed books—conveys the message that reading is a serene and pleasurable, yet active endeavor. 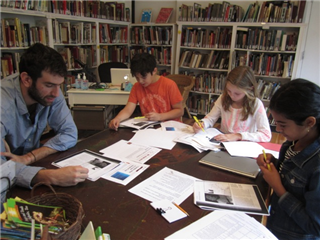 The Research Library plays an essential role in the Social Studies program, which capitalizes on each child’s area of interest within a larger investigation of a historical time and place. The Research Librarian teaches specific, developmentally appropriate research skills, which grow progressively more sophisticated as the children age, become more independent, and begin to pursue questions of greater complexity. By the time the children reach the Middle School, the library has become a natural extension of the classroom. In a school whose goal is to encourage and inspire children’s natural desire to learn, the Library provides the resources and structure through which students may discover answers to their questions, and, in the process, subsequent new questions. Both the research and reading aspects of the program serve to help students view books as a source of pleasure and information, and an exciting means of extending their understanding of the world around them and of themselves.